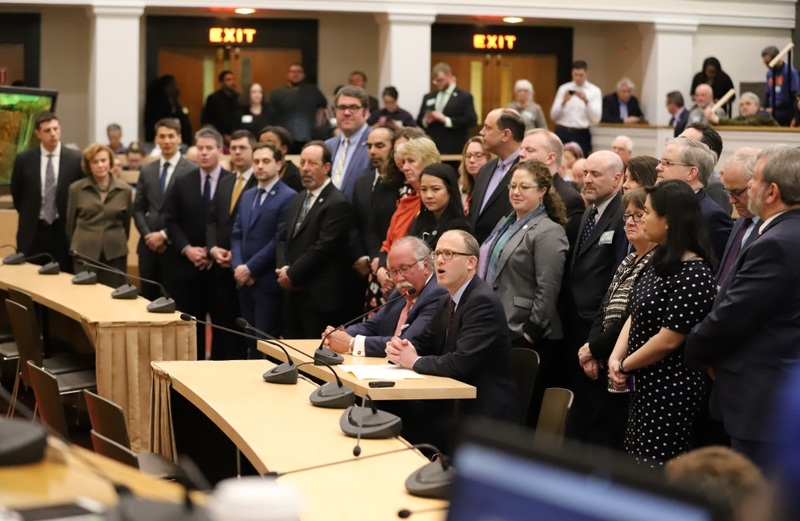 ADJOURNED 'til Monday at 11 a.m.
STATE HOUSE, BOSTON, APRIL 11, 2019.....The last time activists pushed for a surtax on income above $1 million, it was more or less expected that the proposal would face a legal challenge. But now, less than a year after the Supreme Judicial Court invalidated a citizen's petition seeking a constitutional amendment to add the 4 percent surtax, proponents are confident that they can avoid the same obstacle. Sen. Jason Lewis and Rep. Jim O'Day have filed proposed amendments (H 86 | S 16) that would add a 4 percent surtax on every dollar of personal income above $1 million. Get the Rest of the Story! State House News Service subscribers include media outlets, corporations, non-profits and law offices of every size. You may request a free 21-day trial of the News Service for your company by submitting the form below. If you are already a subscriber and need access to SHNS, please send an email to news@statehousenews.com or call 617-722-2439. Please fill in all requested information. ZIP code or phone number is not valid. Address City State MA AKALARAZCA COCTDCDEFL GAHIIAIDIL INKSKYLAMA MDMEMIMNMO MSMTNCNDNE NHNJNMNVNY OHOKORPARI SCSDTNTXUT VAVTWAWIWV WY Other/Int'l ZIP Phone: ( ) ext. 'E-mail' and 'Confirm E-mail' must match. How did you hear about SHNS? What's your primary area of professional/issue interest? ---Please Choose--- Arts/Cultural Affairs Budgeting Business/Employers Consumer Issues Education Elderly Affairs Energy Environment General/All Issues Health Care Health Insurance Housing/Real Estate Human Services Labor/Employees Law/Judiciary Legislation and Legislating Politics POLLING Public Safety Social Issues Taxation Tourism Transportation How would you like to receive the News Service? Submitting this form will allow your organization to receive the News Service free for 21 days. Your trial subscription will begin after we process your request. Please fill in the information above completely. We will not send you any e-mails unrelated to your trial. Note to political campaigns: We do not accept trial requests from campaigns from June 24 through Election Day. However, we would be happy to start a pre-paid subscription for your campaign (except for constitutional offices, congressional offices and statewide campaigns) at a deeply-discounted rate of $22/week, paid through the election. Simply email Virginia Cummings to set up this subscription; she'll send you further instructions. Click here to start your free, no-obligation, 21-day trial.